individual messages on a beautiful webpage!" Imagine living overseas and unable to get together with your family and friends on your birthday, holidays or other special occasions. But, then you receive an email taking you to a beautifully laid out webpage full of individual loving messages and a photo from each of your family and friends saying how much they miss, love and appreciate you. Or you've just lost your job and feeling down when in comes a LoveBlast® from all the people special in your life telling you not to worry, how much you're loved and appreciated, and you're sure to find a job soon. You've just added a new bundle of joy to your family and you receive a beautiful LoveBlast® full of congratulations from all your family and friends saying how happy they are for you and how they wish you and the new one all the best for the future. 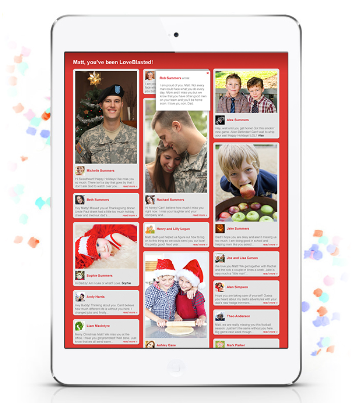 A LoveBlast® gives you, your family, friends or anybody you want to invite the ability to quickly create and send individual messages of love, appreciation or support along with a picture. These messages can be viewed on a beautiful online webpage by the individual or group it's created for (up to 5 people) and all those that contributed. And, there really is no limit to the number of people you can invite to add their message. You can even set a future date and time to automatically send your LoveBlast®. The ability to automatically send a LoveBlast® at a future date makes it so easy, fun and hassle free to set up. Simply set a date and time for it to automatically send, invite your friends and family to add their messages, and on the special day know that a beautiful predesigned LoveBlast® is going to arrive to the lucky person or persons receiving it. This is perfect if you want your LoveBlast® to arrive automatically on a particular day for a birthday, wedding, anniversary, or any special occasion. Choose who you would like to receive the LoveBlast®. This can be from 1 to 5 people in each LoveBlast®. photo and their special message. or you can send it at any time with one quick click. with all the messages of love, appreciation or support. And, it's All Done In An Easy To Use Social Setting. Everybody you invite to join you in your LoveBlast® will find it incredibly easy to write an awesome message due to the social aspect of the site and the easy to use prompts, especially as the person has time to think about what they want to write. And, throughout the process you can see what other people have added to their LoveBlast®, make comments and even send messages to everybody involved making it even easier and fun as well as very interactive and social. And of course, you will be able to see the great end product when it's sent out. And, It's Great For Any Occasion! love and appreciation.... a gift that will be truly treasured forever!